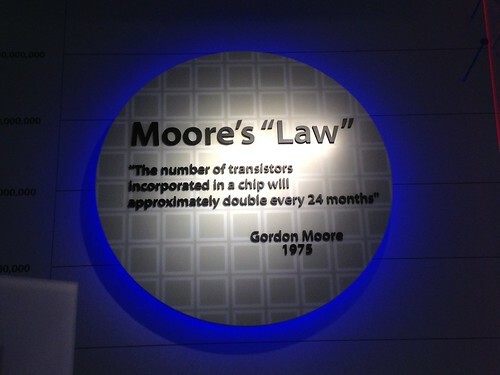 Moore’s Law is about to break completely. What then? Photo by sirexkat on Flickr. A selection of 8 links for you. Ah-hah! I’m charlesarthur on Twitter. Observations and links welcome. The $1.2bn offer is a 53% premium on Opera’s close as of February 4 on the Oslo stock exchange. Trading of the company has been suspended for two days following buyout rumors. Opera began looking for a buyer in August 2015, following slumping earnings after a steady loss of browser marketshare and slowing advertising sales. Missed the “fat lady sings” headline. FBI Director James Comey said on Tuesday that federal investigators have still been unable to access the contents of a cellphone belonging to one of the killers in the Dec. 2 shootings in San Bernardino, California, due to encryption technology. “We still have one of those killer’s phones that we have not been able to open,” Comey said in reference to the San Bernardino attack. Syed Rizwan Farook, 28, launched the Islamic State-inspired attack with his wife, Tashfeen Malik, 29, at a social services agency in the California city, leaving 14 dead. So they’re not actually trying to figure out who the culprits are. So, crypto works? About a month ago now, Reddit user 19683dw pointed out the fact that there aren’t really many guides out there that attempt to tackle this issue. He and fellow redditors put together a great list of points, and it inspired us to run with his idea and dig a bit deeper. Not every point made in the Reddit thread is mentioned here, and we also added several different points of our own, but we do recommend checking out the original post and wanted to give a big thanks to 19683dw for putting this idea on our radar. Among them: “don’t install the official Facebook app” (rapidly becoming this year’s meme on both iOS and Android); “don’t expect an Apple-like experience”; and “don’t install apps with unnecessary permissions”. A very subtle story, well told. Applicable to lots of things today too. [Donna] Bush [aged 72] lost her husband David to lung cancer in August. The couple owned an iPad and an Apple computer. Bush knew the iPad’s log-in code, but didn’t know the Apple ID password. “I just had the iPad. I didn’t touch his computer, it was too confusing to me … I didn’t realize he had a specific password I should have known about … it just never crossed my mind,” Bush said. So when her card game app stopped working, the family tried to reload it and realized it couldn’t be done without the password. That’s when her daughter, Donna Bush, called Apple to ask if it could help retrieve the password or reset the account. The Bushes could get a new Apple ID account and start from scratch, but that would mean repurchasing everything they had already paid for. But when Donna called back along with her mother and the requested information, she said, customer service had never heard of her. After many phone calls and two months of what she describes as the “runaround,” Donna provided Apple with the serial numbers for the items, her father’s will that left everything to his wife, Peggy, and a notarized death certificate — but was told it wasn’t enough. “I finally got someone who said, ‘You need a court order,'” she said. Clearly Apple needs to figure out if a death certificate is enough, or not. A lot of these stories – about all sorts of companies – boil down to “but we called customer service again and got a different story..” The procedures are there, but not applied. For more context, note that Intel is going to do three, rather than two, generations of 14-nanometre chips before going for 10nm. This is an inflexion point whose importance we might only realise some years from now. Fraudsters who attempted to scam TalkTalk customers by using records of their maintenance engineer visits are thought to have bought that info from current or former staff. According to one ex-TalkTalk employee, who asked not to be named, the company uses a third-party system called Qube Portal to book visits and record information. The platform is also used by EE and BT for booking third-party engineer appointments. Our source speculated that criminals may have gained access to TalkTalk information via the portal. The system is thought to log the customer’s name, account number, landline number, mobile contact number given, address, and date of birth. Approximately 1,000 agents based in India, where TalkTalk’s technical support team operates, have access to that information. Our source said only about 100 agents in the UK are familiar with the system. The source also claimed that the system was accessed by a shared login and password that hadn’t changed for the last four years. The latter not a surprise, but the details of the poor security are eye-opening. It’s increasingly evident that large organisations can’t do effective security. Not even the NSA, of course.